Cut paper, cardboard, chipboard, felt, and cloth, but not fingers! 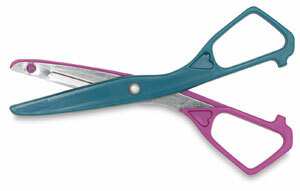 Super Safety Scissors have metal blades inlaid with plastic to assure safe, stay-sharp cutting. These scissors can be used by both right and left-handed students. Rustproof with blunt ends.